Are you watching American Idol this season? 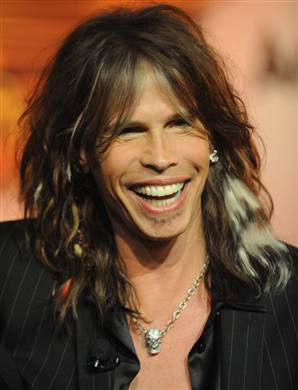 I have noticed quite a few comments out in web land about Steven Tyler’s Feathers. Folks weren’t certain if those are some new kind of hair extension, or what. Well Steven says they are feathers. And guess what! Maria Armenteros just purchased a whole new assortment of feathers for her clients! They are fun and playful, and quite beautiful. If you would like to rock this trendy new do, please call Maria Armenteros at (562) 972 5006 for your appointment today. THIS COMING WEEK, I HAVE SOMETHING SPECIAL IN STORE FOR YOU!! For the week of April 1, 2011 only, bring in your hair extensions, and Maria will put them in for you at 50% off our regular rate. Normally $150 per hour, our special rate this week will be reduced to only to $75.00 per hour!!! If you have an upcoming event, or just need to update your look for spring, this is a great time to try hair extensions, and maybe even a feather or two. Questions! Give me a call, at 562.972.5006, and check back here for up to the minute news about hair styles, color and more !!! Maria Armenteros to Compete in Color Zoom Challenge 11. In 2011, GOLDWELL continues the search for the most creative trendsetters. Maria Armenteros will join this unique and inspiring competition to create the international trends of the future. Goldwell’s Color Zoom Challenge is looking for the new creative team that will create the next, global Color Zoom Collection 2013 together with the international Master Team! Contestants will demonstrate their color competence and show that they are able to interpret trends in a highly creative way. They will seek to make themselves known in the hairdressing industry all over the world. Maria is ready to set the trends! INTERPRETATION OF THE TREND WORLD. COLOR TECHNIQUE AND PRODUCT USE. PROFESSIONALISM AND AESTHETICS OF THE PICTURE. Maria is excited about the challenge especially after recently completing rigorous training with the experts at Goldwell. We will be posting updates from time to time so you can follow along as Maria represents us all in this prestigious contest. In the mean time, if you are looking to set your own trend for 2011, please call Maria today for your appointment at (562) 972 5006. Lady Gaga Voted Least Favorite Hair Style Again! The 17th annual Sally Beauty Best Tressed® Survey participants voted Lagy Gaga’s over the top hair styles their least favorite for the second year in a row! Best tressed honors went to American Idol judge, Jennifer Lopez. 26 percent of women chose “shiny” as the one thing they want their hair to always be. “Smooth” and “curly” tied for second, with each receiving 24 percent of the vote. Almost 60 percent of women turn to their hairstylist for special day style recommendations. 29 percent choose their style based on trends and 11 percent look at celebrity photos. 42 percent of women do not look at reviews prior to purchasing a new styling tool. 32 percent of women say $20 is the most they would spend on a beauty product, while 20 percent say $10 is their limit. 75 percent believe the right products and style can take 5-10 years off their look. 60 percent of women say price has the biggest influence over what product they buy. 27 percent purchase products based on hairstylist recommendations. How do these opinions stack up against your own hair care sensibilities? If you are ready for a new celebrity look, please call (562) 972 5006 for your appointment with Maria Armenteros at Ambiance Salon, in Huntington Beach. The Sally Beauty Supply Best Tressed(R) Survey polled results from 1,000 women and was conducted by MarketTools, Inc. The survey ran from December 13, 2010 to December 16, 2010. I had the pleasure of being featured again in the Summer 2010 issue of HB Magazine. Check out the feature and one of my ads from the same magazine.